For the final Week in Review we take a look at, obviously, the final match of the season. There were questions raised concerning the offside decisions made by PRO assistant referees in the MLS Cup Final, especially with Toronto FC's first goal. We will take a special look at that one and show how the VAR was able to confirm that Jozy Altidore was onside by using of all things...the helicopter camera. With the regular season data showing us that assistants usually dealt with an average of 5-6 offside decisions per match, the Cup Final had three times that. So for the final time this season, let's check out how the two assistants performed by looking at nine crucial decisions, some which left certain announcers (TT and SB, for two) unsuccessfully trying to find controversy. For those keeping score at home, AR 1 was Adam Wienckowski and AR 2 was Jeremy Hanson. Oh, at the end, you will be able to find the answer to last week's What Should You Do? and the Call of the Playoffs Winner. Ten minutes in and Toronto had already created a couple of scoring opportunities when Giovinco times a run that puts him in on goal and he would have scored if not for the fine save by Frei. On the initial pass Jozy Altidore is in a clear offside position and although the ball passes near him he makes no play on the ball and does not interfere with an opponent. A good example of wait and see by AR 2. Toronto continues to press and nearly puts Morrow in on goal, but the flag is up. The offside decision is close, but the line shows that he is half a body offside. It is a difficult decision when the second to last defender and forward a far apart and it takes perfect positioning to get this call correct. Honestly, not sure why I included this one. Grade 8 referees get this call every time. Not all the calls made by assistants need to be difficult. Don't worry AR 1 will have some big calls in the second half. This was just his warm-up. This situation had offside written all over it, until you look at the freeze frame. The ball gets to Toronto's Morrow by deflecting off Giovinco, at that moment he is even with Seattle's Jones at the far post. If the assistant is in good position then the second to last defender's body (Jones) will block his view of the far side attacker, with this knowledge he can know that he is even and keep the flag down. Even being ahead or behind a step or two from the STLD can change the angle of view enough to misread the positioning of the players. It took 66 minutes for Toronto to finally break thru and score a goal and the scoring sequence starts with eventual goal scorer Altidore moving from an offside position into onside. One of the most difficult decisions for an assistant referee to make because this is reverse from the usual scenario where an attacker goes from an onside position into offside. In this case the pass is perfectly timed and at that moment he is even with the second to last defender. I have include two frozen images of the play from the on field camera angles to show how deceptive they can be. Lines have been added (by Week in Review), however they are based off the lines in the grass, which are only as accurate as the grounds keeper's ability to mow in a straight line. Since a goal was scored Video Review comes into play and in watching the VR monitor replay, you can see that the VAR has immediately noted that an offside situation needs to be checked before the goal can be confirmed (no audio on this clip). The first action is to find the best angles available, which at first are the two angles shown above. However, the VAR is not comfortable using these less then ideal angles to determine offside. VR protocol allows for the use of any angle that is available to the broadcasters, and on this play the helicopter camera was directly above and best positioned to show the positions of the players at the moment of the pass (line added by Week in Review). Once the VAR has seen this angle he can confirm that a clear and obvious error has not occurred and does not need to send this play into a formal video review. Most neutral observers would agree that this angle provides ample evidence that the attacker was not ahead of the second to last defender. Many fans were looking for an offside flag on this play, however the player that received the ball from the errant shot was kept on by a defender at the far post who was quickly moving up. A second offside positioned attacker nearby does not interfere with play. Good concentration to focus on the position of the second to last defender. One of the few offensive forays in the second half for Seattle resulted in a good no offside decision. 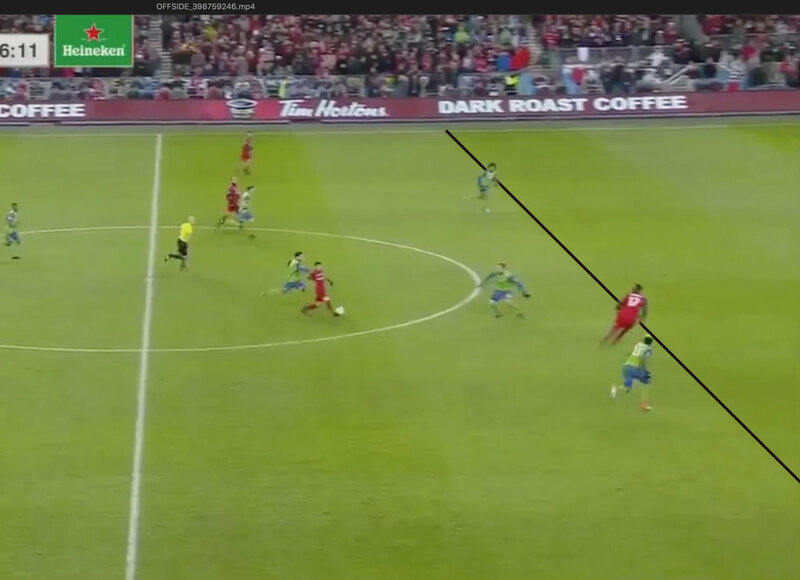 Lodeiro appears to be offside when he brings the ball down with his chest, but a good side angle replay shows not only the AR in good position, but concentrated on the timing of the pass. This comes from regular offside practice and taking the perception test available on this site. Seattle would eventually get a corner kick off this play and a second offensive opportunity. At first glance Giovinco appears to be yards offside, but on review, he was in his own half of the field when the ball was played. Good no flag decision which led to an exciting chance on goal denied by a good defensive play. Some questioned whether Vasquez was in an offside position when he played the rebound off the goalpost into the net. These less than astute fans noted that the goalkeeper was off his line and he only had one defender in front of him and thus, had gained an advantage. However, on replay, Vazquez not only has the goalie and a defender in front of him, but he is clearly behind the ball when the original shot was taken. Although plays like this can be complicated because of the rapidly moving players and rebounding ball, PRO ARs train to take a mental picture of where attackers are positioned on all shots so they are ready to make a decision should there be a deflection or rebound. This is not offside. The key to this play is the second part of the new guidance in Law 11 where it stipulates that it must impact on the ability of the opponent to play or challenge for the ball. I think we can all agree that the attacker did impede his opponent ever so slightly, but it is also clear that it had no impact on the opponent's ability to play or challenge for the ball.